Trebizon: An Overview | So This is School! Anne Digby’s Trebizon books were mostly written in the 1980s, but they share many of the tropes and traditions of the Girls’ Own genre. The sporty heroine with a talent for writing and a penchant for solving mysteries, the group of friends, the kind, wise headmistress, even the rivalry between school houses. I only read the later books in the series a few years ago, but since Secret Letters at Trebizon and Fifth Year Friendships at Trebizon were reprinted by Fidra Books they’re much easier to get hold of. We start with First Term at Trebizon (1978), perhaps the Trebizon book that conforms most strongly to the Girls’ Own tradition. The action begins almost immediately, with Rebecca encountering powerful prefect Elizabeth Exton and suffering the usual friendship difficulties before settling down with those who, with their sportiness and general jolliness, are clearly the right crowd. Elizabeth Exton is a splendid villain, although she suffers from a lack of characterisation which is probably a result of the shortness of the book. Interestingly, although Elizabeth is caught and expelled for her dishonest activities, the usual end-of-the-book reform is absent, which although realistic might be unsatisfying for some Girls’ Own fans. Second Term at Trebizon (1979) takes friendships as its theme. Rebecca’s friendship with Tish Anderson and Sue Murdoch was cemented in the first book when they backed her up against Elizabeth Exton, but this term sees their acknowledged leader, Tish, being strange and rather unpleasant to Sue. Rebecca can’t help trusting Tish, which hurts and alienates Sue even more, and Rebecca’s resolve to trust her friend is tried to the limit before everything is finally sorted out. Again, the book’s too short to allow for more than one major plot, but the theme of Second Term allows for significantly more characterisation of the main characters than First Term. In Summer Term at Trebizon (1979) it’s Rebecca’s worries about her academic success that come to the fore. She is intelligent, but, like many Girls’ Own heroines, her weak point is maths. Unfortunately, the new maths teacher, Mr Maxwell is young, good-looking and conceives a strange liking for unpopular Roberta Jones, spending all his time coaching her and leaving Rebecca to struggle. The second thread is the raising of money for a charity and the subsequent mystery (again, a popular Girls’ Own theme) of who has stolen the Second Form’s money. It’s interesting, though, that while ‘Max’ is clearly the villain of the piece, not all of his influence is bad – Roberta blossoms under his attention and becomes much nicer as a result. The main theme of Boy Trouble at Trebizon (1980) is obvious from the title, and here Anne Digby really diverges from the Girls’ Own tradition, where boyfriends at the age of fourteen are unheard of. In fact, it’s hardly a romance and, while Rebecca is jealous of Robbie Anderson’s liking for Virginia Slade, the major focus of the story is her instinctive trust of Robbie and determination to continue helping him, even though he comes across as a bit of an idiot. So does Rebecca’s tennis coach, David Driscoll, who also engages in a half-hearted and slightly creepy pursuit of Rebecca. Rebecca herself, despite her youth, is the one who seems sensible and mature in this book. More Trouble at Trebizon (1981) continues the theme of boys and parties but with the added frisson of adventure – another staple of the Girls’ Own genre – when Mara, daughter of a rich shipowner, returns to school with a bodyguard. The secondary plot revolves around Lucy, the youthful genius who arrives in the Third Form at the beginning of term and ends up contributing to the adventure in no small way. Mara has been a minor character up until this, the fifth book in the series, but More Trouble at Trebizon finally allows us to get to know her a little better. The theme of sport is one that has been important all through the Trebizon series, but in The Tennis Term at Trebizon (1982) it finally comes to the fore again, with Rebecca working blindingly hard at her tennis and making it onto the school tennis team. In addition, there’s a mysterious hoaxer in the school and Rebecca finds herself under suspicion. It’s all good, traditional, Girls’ Own stuff with a couple of nice twists and a healthy dose of coincidence. The first and only holiday book in the series, Summer Camp at Trebizon (1982) starts oddly with an irrelevant adventure for Rebecca. As soon as she returns to school, however, the story starts properly, and the theme seems to be social issues. The girls are helping out an organisation who give holidays to city children. It’s a little implausible that in the entire camp there is only one child who gives trouble, and the sweet and sugary resolution is also hard to swallow, but the archaeological backdrop and the sun and sea mean Summer Camp is still an enjoyable read. With Into the Fourth at Trebizon (1982) we return to the theme of friendships. Mara has to move into a single room down the corridor to make space for Swedish Ingrid, and is angry and upset because she feels left out, while Rebecca is frustrated because Ingrid starts clinging to her. In addition, Rebecca’s extra tennis coaching means that she can’t see as much of Robbie as she’d like, and the crowning blow comes when it seems that Ingrid has stolen Robbie from her. There’s another of those syrupy endings, but Anne Digby’s writing is just about engaging enough to make up for that. Once again returning to previous themes, The Hockey Term at Trebizon (1984) is all about sport. Rebecca and her friends are obsessed with the upcoming hockey sevens tournament and Rebecca’s confidence in her tennis is knocked by brilliant Joss Vining. The second plot thread belongs to new girl Fiona, who appears to have second sight (a not unknown idea in Girls’ Own literature). As might be expected, this turns out to be trickery, but Fiona is redeemed by the discovery of her secret talent as a footballer – a typically Girls’ Own redemption. I don’t care for sports storylines, so this isn’t one of my favourite Trebizon books, but it’s still a fun read. Fourth Year Triumphs at Trebizon (1985) once again starts with sport – by this time it’s Rebecca’s main interest. Tish’s running is also a major thread, since she conceives the plan of running to Mulberry Island and back during an extra low tide. The book’s second plotline concerns a film that’s being made of Trebizon, and Rebecca’s dawning realisation that it’s going to be a damaging mass of untruths. Once again, the dramatic conclusion is a little unlikely, but it certainly makes for a sensational story and is no less plausible than many traditional Girls’ Own stories. The Ghostly Term at Trebizon (1990) is even shorter than the previous books and departs from the sport theme, as Rebecca breaks her wrist at the beginning of term. Most of the plot, which is surprisingly vague for Anne Digby, revolves around Rebecca’s struggles with her tennis and her meeting with old friend Cliff, inspiring much jealousy from Robbie. The theme of ghosts takes a secondary role and provides the traditional mystery for Rebecca and her friends to solve. Academic work also rears its head again, finally, in this, the eleventh book in the series. 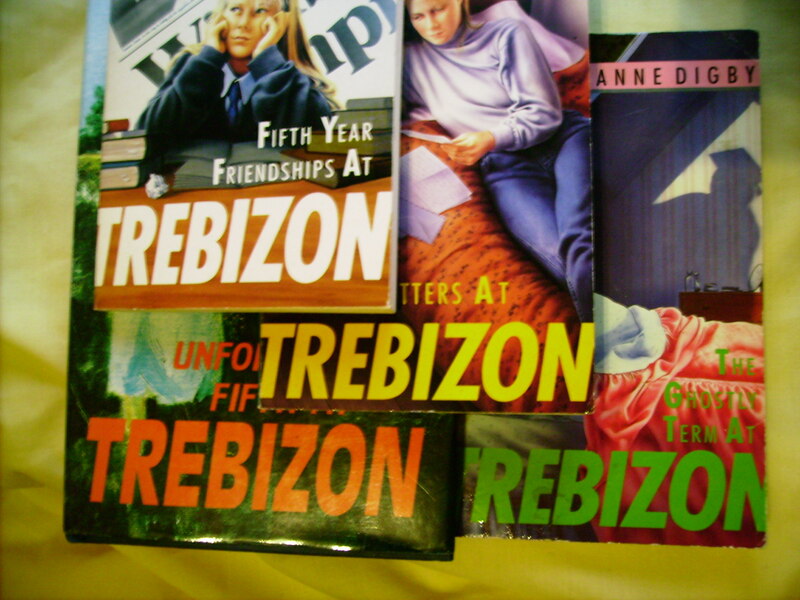 The academic theme is once more important in Fifth Year Friendships at Trebizon (1990), when Rebecca finds that she is going to have to make a choice between being a professional tennis player and applying to enter a top university. Rebecca’s almost implausible brilliance is really highlighted in this book, although it’s no more extraordinary than that of many Girls’ Own heroines. This plot, and the secondary one about a misguided pair of twins, makes for a slightly meatier plot than that of The Ghostly Term at Trebizon, with Rebecca working extremely hard and not always dealing well with the pressure. The real mystery of Secret Letters at Trebizon (1993) is that someone is going through Rebecca’s possessions in secret. She and her friends go to a lot of trouble to discover the culprit and it’s interesting that when they finally succeed the twist at the end seems to be entirely for narrative suspense rather than a logical development of character or even to prove a moral point, as some traditional Girls’ Own stories might try to do. The book ends with the Cliff/Robbie/Rebecca situation still unresolved, a storyline which has now continued for quite a few books. The final book in the Trebizon series, The Unforgettable Fifth at Trebizon (1994) begins with Rebecca and Tish finding that they can’t go for their usual morning run because Mulberry Island and the headland are being sold to the Tarkuses, long-term enemies of Trebizon. There are many dramatic twists in the plot, but by now it’s fairly obvious how this storyline will end. Perhaps more interestingly to devoted readers of the Trebizon books, Rebecca is eventually forced to make a choice between Robbie and Cliff and passes her GCSEs not, fortunately, with implausible brilliance, but well enough to make a satisfying end to the book and the series. The shortness of the Trebizon books – most of them come in at around 120 pages – means that there is very little opportunity for complex plotting, and most of the character development takes place over a number of books. Instead, each book concentrates on a specific problem to be solved by Rebecca and her friends, while themes such as academic progress and Rebecca’s increasing skill at tennis are usually spread across the series. The Trebizon books, although they appear to deal with more adult themes than most Girls’ Own books, seem, in style and structure, to be aimed more towards younger readers. Although there is a certain amount of character development across the series, the majority of the girls and staff remain shadowy, with only one or two distinguishing characteristics. The plots are simple and the language plain and unchallenging. Anne Digby also develops an irritating habit of constantly foreshadowing future events. For example, in Secret Letters at Trebizon, Rebecca’s History results are mentioned as being the most important of all but the reason for this isn’t explained until afterwards – rather odd, since this is hardly significant as part of the book’s plot. Despite these flaws, however, the Trebizon books are a light and entertaining read that doesn’t take up too much time and is interesting for both its similarities and differences to the traditional Girls’ Own genre. I especially recommend the first three or four in the series as nice, sensible books that are a little different and yet pleasingly familiar. I love the fact that a Girls’ Owen series includes so much about tennis, but I think that’s probably just me! The Trebizon books always feel like the boarding school genre updated for my generation, though. & I’ve always wanted a dress like the one Mara lends Rebecca (IIRC), although I’d probably look terrible in it! As a Swedish girl myself, I always resented the negative portrait of Ingrid Larsson, the Swedish girl in “Into the Fourth at Trebizon”. All the other ethnic groups seem to be treated pretty kindly. So why such a very nasty Swedish girl? Also, all the sports fixation bores me stiff. Apparently you can’t have a school story without it. In that way, the first book is my favourite, where the plot revolves mostly around Rebecca’s writing and the school magazine. Oooh, I love the Trebizon books, although I’ve never read the last one in the series because of being a tiny print run and extortionate prices for a second-hand copy – waiting to Fidra to reprint it, but haven’t heard anything about that yet. I preferred the books without too much of a sporty emphasis – the earliest ones, and the Ghostly Term, and was disappointed that writing didn’t stay important to Rebecca once she’d discovered tennis. But I love the setting and the characters, even if the writing comes across as a bit simplistic when I read it as an adult. Definite favourites though. I enjoyed reading these in the 90s, when the local library had many of them, doubt they do know. Recently I bought five of them again and have just read Second Term at Trebizon. Having been to a (now defunct) boarding school myself that was very different in many ways from the fictional one, I can nonetheless perhaps relate to some elements of the setting/characters/plot. Also don`t care much for sports storylines though, and I do wonder why Ann Digby, unlike say Enid Blyton, did`nt continue the series right through to A Levels and the Upper Sixth. Still a good read anyway.